Map data visualization, or otherwise known as mapmaking has become a huge part in the data visualization industry. Companies big and small require data that’s presented in a form, whether it be last month’s sales, productivity or brand performance to see patterns and behaviors that can be used for growth and improvement. 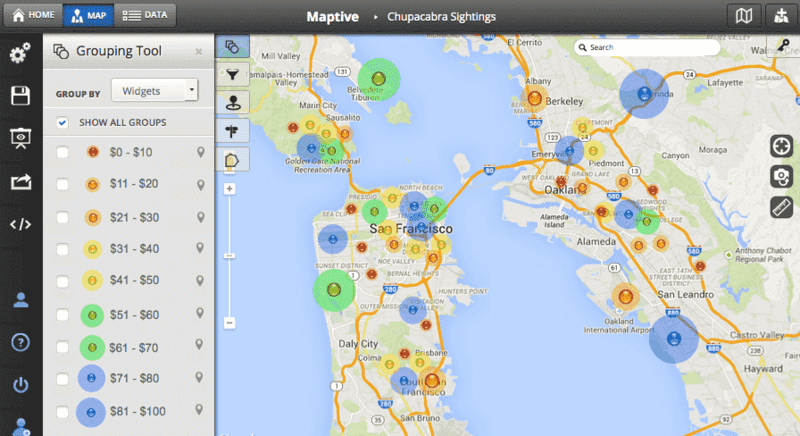 Maptive is one of the best map data visualization software that makes mapmaking easy. The end result is not only a functional data, but a beautiful presentation that’s attractive and professional at the same time. Data visualization helps people see a more relatable picture when it comes to data. The function of these platforms is to take numbers and turn it into a visual presentation. Maptive helps create attractive maps that persuade, inform and educate. Maptive is licensed with level mapping services provided by Google. With the online map creator software, you’ll be able to acquire global coverage with geo-coded data using the 256 bit SSL encryption. The maps you make can be configured and customized to meet any need. Mapping becomes simple, intuitive and won’t take up hours of your time. It’s user-friendly and offers several mapmaking features for beginners. With Maptive, you’ll have the tools to change aesthetic components. You can change the style, upload custom images and add colors to each indicated route for effect and overall clarity. Maptive is built from the ground up to handle any-sized data, from 10 up to a hundred thousand. The API and Google Map Foundation combines to provide features such as real-time updates and auto-synchronization. Users will be able to set zoom levels and views in their data maps. There’s virtually nothing to download or install because Maptive is a cloud-based application. You can conveniently create, share, and send maps using any compatible device.